ISIS (or ISIL or, in Arabic, Daesh) has been busy not just killing Jordanian pilots and Coptic Christians but also destroying antiquities and burning rare books in Mosul. The almost uniform response has been one of disgust, at least among the online academic community. A friend who worked in the Yale Art Gallery as a graduate student and got to work with some of the antiquities that found their way to Yale from Mosul in the 1850s wrote about why we should care about archaeological destruction. As scholars of religion we realize the already seemingly insurmountable limits to the work that we do. We are some of the first to “care” about this destruction. These artifacts are rare and priceless! They offer us a window into worlds before ours that we cannot replace! These thoughts and more come to the fore when watching videos like the one in question where artifacts deemed “idols” by ISIS are being destroyed systematically and deliberately. Many would respond—and many have—that the destruction of any past object is deplorable. But then, as McCutcheon laid out last year, we should be examining not just that such destruction has taken place but also why we care so much about these particular objects. That is, why do we care about the destruction of statues from Nineveh and not about the destruction of a poem that a third grader wrote? Why is one endowed with the status of “art” while the other is so easily tossed aside? McCutcheon’s point is that scholars are often just as “guilty” as our own objects of study of endowing certain things, certain texts, and certain groups with value, worth, and meaning. We then present as natural—“these stones merit our awe and respect”—that which is arbitrary. At the end of the day these are stylized stones and many stylized stones are not so lucky as to receive our awe and respect. Or, as FSU professor of religion Matt Day used to ask us, “why this rather than that?" I wish to highlight . . . how quickly otherwise nuanced people forget their own understanding of such things as the ideology of the museum, the politics of world history, and discourse of civilization/barbarity, as well as the constructed nature of the past—quickly, that is, when their own taken-for-granted narratives of progressive development, value, cultural authority, and historical interconnection/lineage are called into question by those who, presumably, subscribe to a rather different narrative. His point is well-made and a necessary uncovering of the processes of naturalization that occur in the academy just as they do in the wider world. At this point we seem to have moved from “why we should care” to “should we even care?” But that seems to also be the wrong question. Some will misconstrue McCutcheon’s point and say that we are left with two choices: caring about the destruction of nothing or caring about the destruction of absolutely everything (Snapchat would be anathema). Even McCutcheon has “no interest to smash any statues (ancient or plaster casts), to rip apart any paintings, or to defend” the actions of ISIS. The more appropriate question, then, seems to be how do we care about things like this in a manner that is nuanced, honest about our positionality, and not patronizing or orientalizing? One necessary starting place seems to be recognizing that ISIS does not represent all Muslims or even all residents of Mosul. Representing broad swaths of Muslim opinion, countless groups and figures, including the Islamic Society of North America, the Organization of Islamic Cooperation, and Turkey’s top cleric, Mehmet Gormez, just to name a few, have condemned ISIS. Not only that, ISIS has become a favorite target of satire in many Muslim-majority societies. In this construal of Mosul’s antiquities as the “inheritance of the Iraqi people and their civilization,” there might lie a clue as to how we can acknowledge the tragedy of this situation with nuance and honesty. Al-Abadi’s language brings up a question raised by McCutcheon in his reference to the “ideology of the museum.” That is, how did the ceramics, sculptures, architecture, and other forms of cultural production which we are currently so troubled over come to be considered a part of Iraq’s ancient heritage? One cannot answer this question without attending to Britain’s colonial past in Iraq. In his recent book on the modern construction of Iraq’s cultural heritage, Lawrence Rothfield discusses the ways in which the establishment of museums throughout Iraq stemmed from the British colonial administration’s belief that modern states should have national museums. Among those who played a substantial role in this process was British archaeologist, spy, and envoy to Iraq, Gertrude Bell. In the early 1920s, she took an active part in excavating, documenting, and preserving historical artifacts from Iraq’s Mesopotamian past. She pursued this project despite the fact that the newly coronated King Faisal I, seeking to define himself as the Muslim leader of an Arab nation, demonstrated little care for preserving Iraq’s pre-Islamic past. Receiving no objections from Faisal, Bell proceeded to create what would become a national network of museums and libraries intended to house Iraq’s Mesopotamian past. Later Iraqi leaders would eventually come to embrace this past, most notably Ba’athist president Saddam Hussein. 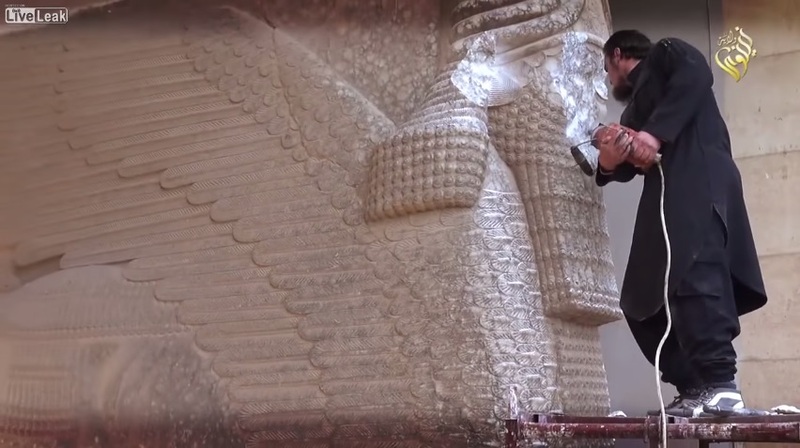 Pursuing a cultural policy during the 1970s that sought to create a cultural heritage that would unite Iraq’s various religious and ethnic groups, Hussein directed generous funding towards those institutions tasked with documenting and preserving artifacts from the ancient Sumerians, Assyrians, and Babylonians. He not only encouraged this work as a means to create a national ethos of “Iraqiness,” he also embraced archaeology as a way to establish his own cult of personality. Hussein styled himself as a modern-day Nebuchadnezzar, even going so far as to hold massive rallies at the ancient site of Babylon. His patronage of the various institutions responsible for preserving these antiquities continued through the 1991 Gulf War up to the 2003 US invasion and occupation which brought an end to his rule. It seems appropriate to keep all of this in mind as we lament the destruction of Mosul’s antiquities. In so doing, we just may be able to care from a position that acknowledges the relative nature of categories like “historical artifact” and “cultural heritage,” that recognizes the roles that colonialism and despotic regimes have played in constructing them, and that therefore does not necessarily malign others who fail to feel as we do about what has recently taken place in Mosul and elsewhere in Iraq. Thomas J. Whitley is a doctoral candidate in religions of western antiquity in the Department of Religion at Florida State University where he studies sexual slander and identity formation in early Christianity. He holds a master of divinity and a master of arts in religion from Gardner-Webb University. His current work focuses on the use of the heresy/orthodoxy dichotomy in late antique Christianity. Sam Houston is a doctoral candidate in comparative religious ethics in the Department of Religion at Florida State University. He holds a master of divinity from Princeton Theological Seminary and a master of arts in philosophy from Boston College. Prior to enrolling at Florida State, he spent two years teaching English in Abu Dhabi, UAE. His current work focuses on the intersections of Sufism, Islamic activism, and virtue ethics. He has published essays in Philosophy and Social Criticism and the Journal of Africana Religions.